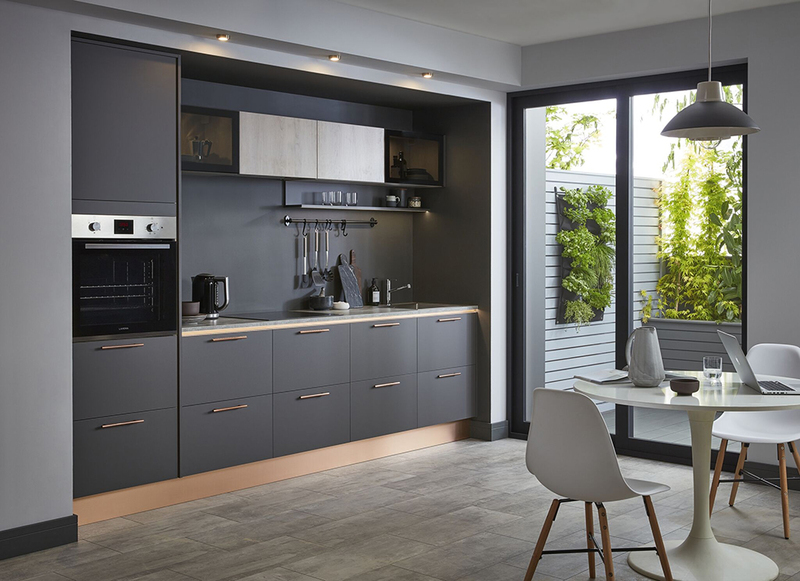 Making big design decisions for your kitchen can be daunting - the pressure to get it right is pretty immense as it's not like choosing a wall colour that can easily be changed if you decide it's not right - there are many decisions to be made from the colour and style of your cabinets, to the floor and work surfaces, right down the all important details like tap and handle finishes and styles. 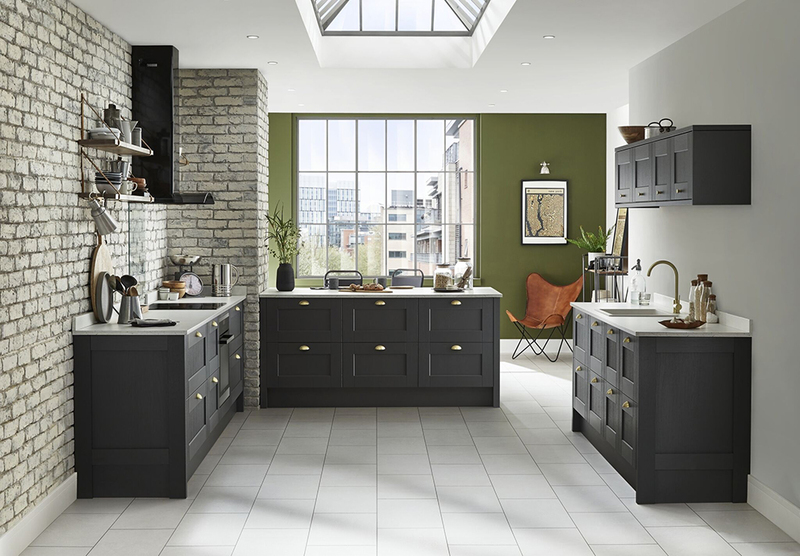 Howdens have created a kitchen trends book for 2019, featuring four trends - Solace, New Industrial, Vogue and Urban Wild. You can download it from the Howdens website and it's a fantastic guide to help you really hone in on your style and create a cohesive look that you'll love for years to come. 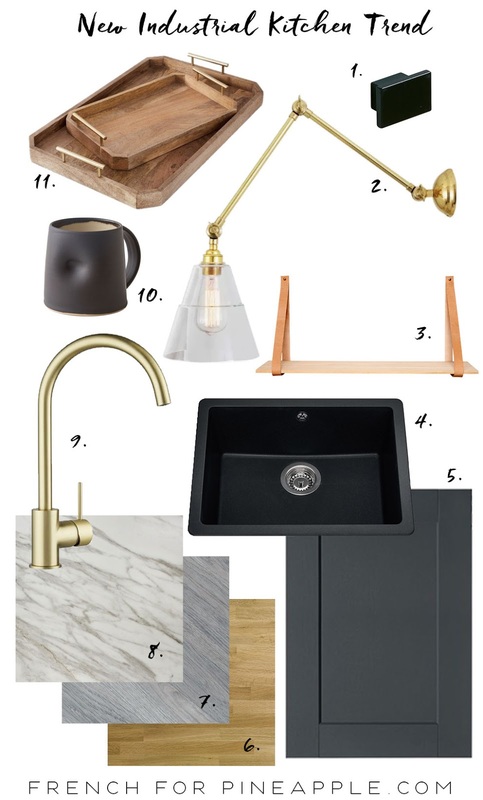 What I love about the New Industrial trend in particular is that it's quite dramatic but unlike traditional industrial looks, it's been really warmed up and softened with natural wood tones and warm metallics, which make a functional space inviting and cosy. 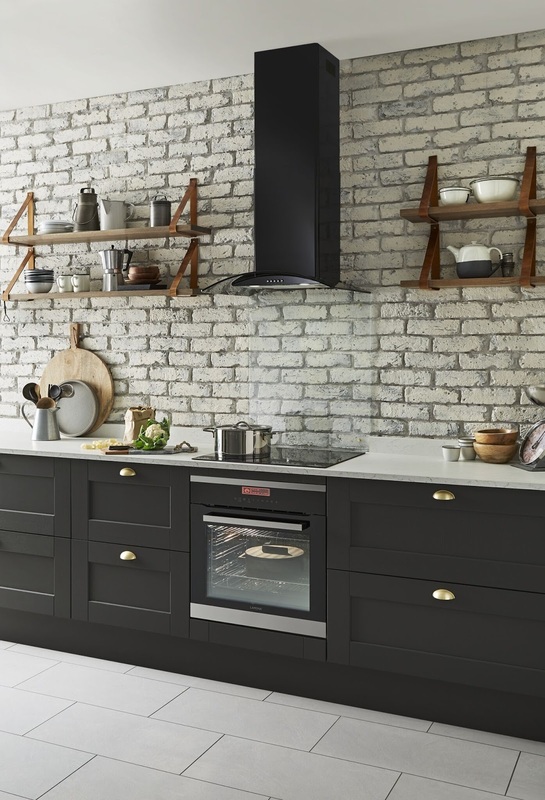 I love the Fairford Shaker style units as a base for this look in charcoal, with a wood grain finish. 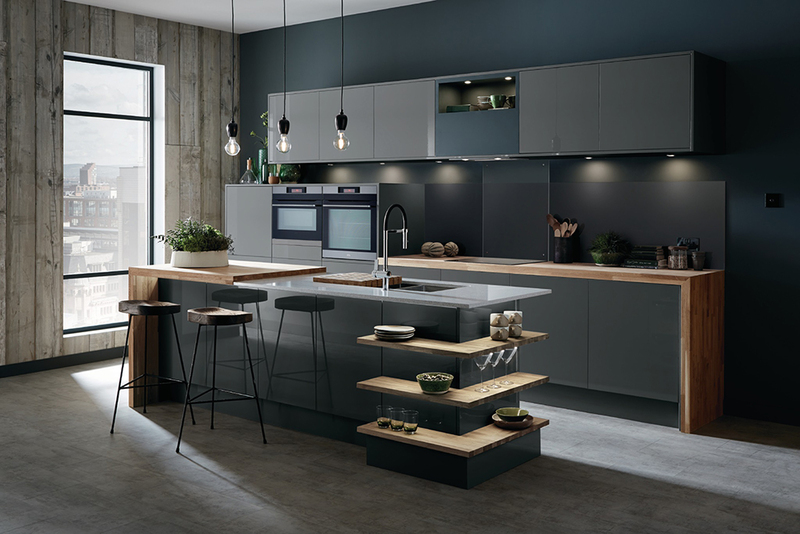 This look is all about moody colours and texture, so these are a great base from which to build your finished design. For worktops, think marble look or solid oak block (or why not opt for a mixture of the two!) to further enhance the look with more movement and texture, and to contrast against a darker base unit. Open kitchen shelving is hugely popular, and for good reason - it helps the room to feel bigger whilst providing a place to display pretty pieces. Consider wooden shelves with tan leather brackets which tie in beautifully with this look, the rawness of the leather balances any hard edges whilst adding more texture. The trick is to keep the open shelves ordered and store less attractive pieces hidden away cupboards. Perfectly imperfect ceramics are both beautiful and practical to use and to display on open shelves. Lighting is super important in kitchens - more so than any other room in the house. Good bright overhead lighting is essential for preparation and cooking, but come evenings when the cooking is done, kitchens often become more social spaces and it's a great idea to have secondary lighting on a separate circuit. Whether this is for pendant lights over an island or wall lights (or both), it's these lights that will provide a welcoming ambience and take the lighting from purely practical to atmospheric. Don't forget to make sure these lights are on a dimmer switch. I particularly love wall lights in kitchens, as not only do they offer that all important ambience, but they elevate the space from plain to interesting, and lend an air of subtle glamour. 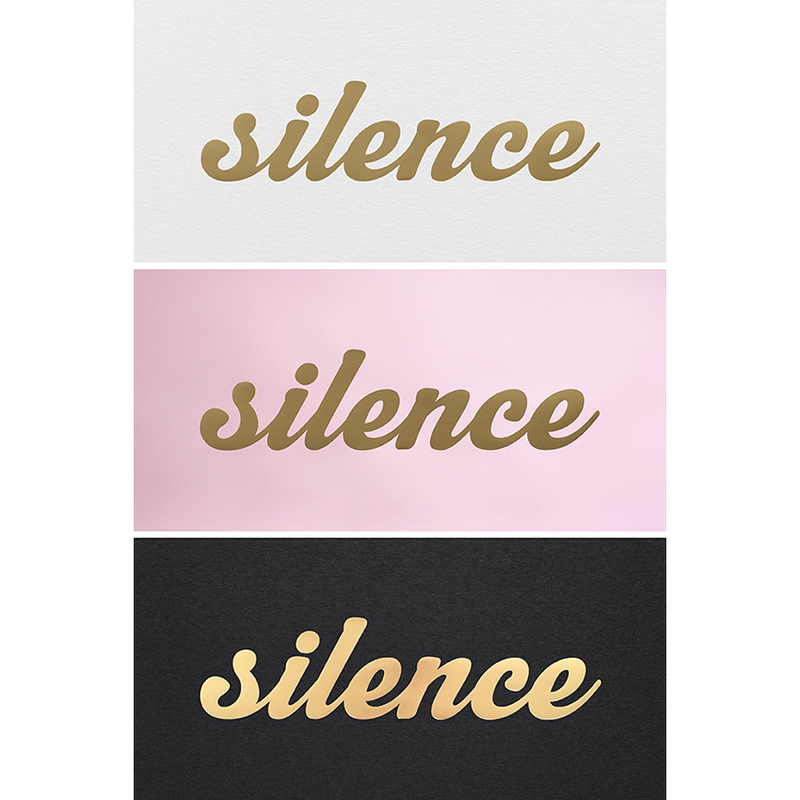 I've put together a couple of favourites that all tie in beautifully with the New Industrial look. 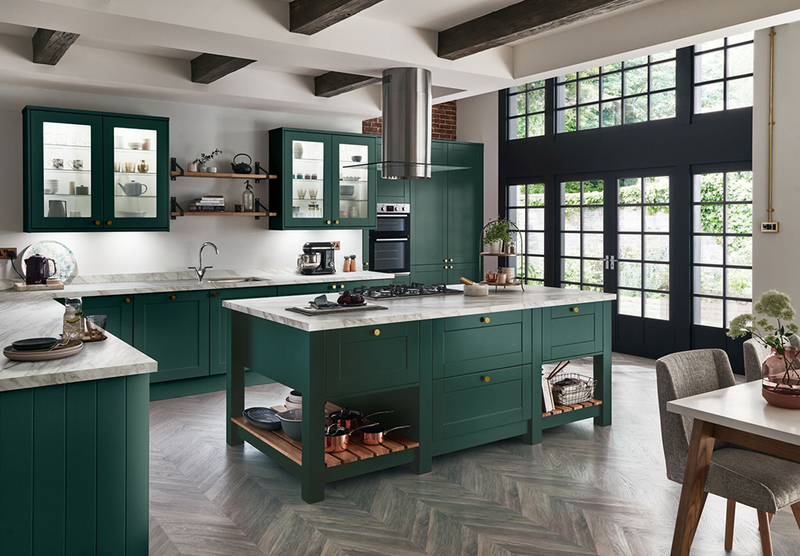 For flooring I love a wood look in a kitchen, so the Rustic Chestnut Oak Fast Fit Flooring or the Grey Chevron Laminate Tile Flooring is perfect, but that said the Concrete laminate looks great with this look too and doesn't feel cold underfoot. 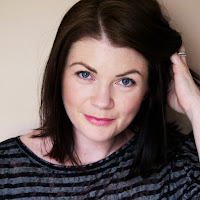 The key to really nailing this look is to limit the colour palette which keeps things from getting too busy, whilst adding plenty of mixed textures to stops it from being boring. Think moody soft blacks and charcoals, to deep muted greens and blues, then add in your choice of metallics to lift and enhance with their light reflective qualities. 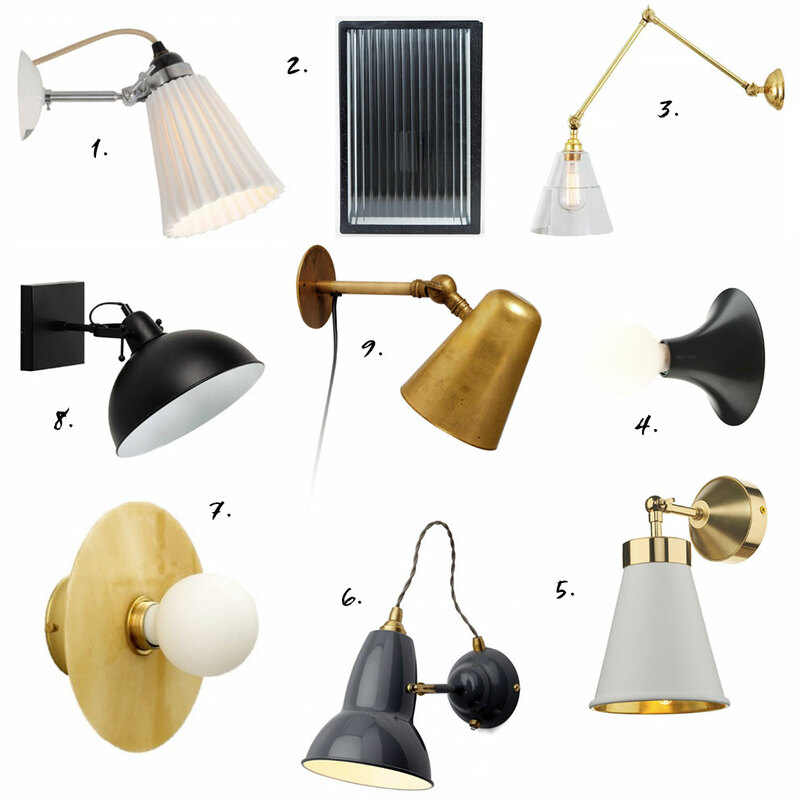 I'm a brass fan personally, but go with your heart and don't be afraid to mix metals too!